Need to book a group study room? The process has now been fully automated, meaning you can book from wherever you have access to the internet on a computer or mobile device. 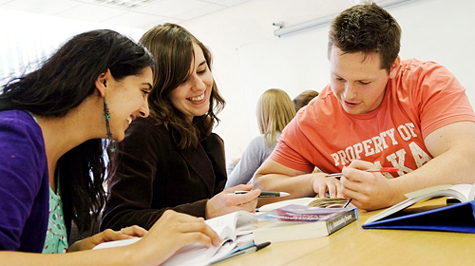 The direct web address you’ll need to use is https://mspluswrb.cf.ac.uk/libraries/, or from the cardiff.ac.uk home page, select the Students & Staff tab, then Libraries, then Find a group study room, then select the online booking link and log in using your Cardiff University username and password. Step 1: Using the drop-down box, select the number of people who will be using the room, and then select the Bute Building from the list of locations. Step 2: Select a date (tip: click Select multiple days/weeks if you wish to book multiple days in multiple weeks). Step 3: Select a start time and a session length (the maximum time allowed per session is 2 hours, back-to-back sessions by the same group that exceed 2 hours will be declined). Step 4: All available library group study rooms within the Bute Building will be shown here. 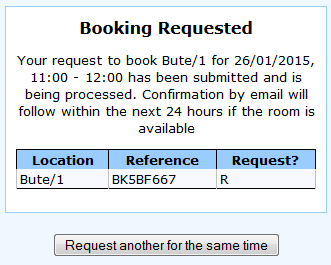 If a room is already booked, it will not appear in the list. We have 2 rooms in the Bute Library and 2 rooms in the Architecture Library on the 2nd floor, numbered 1-4. If no rooms are available for this time slot, click on Show more options to display more available time slots later in the day. You could also go back and select a room in one of the other libraries on campus. Select the room you’d like to book from the list by ticking the box. Step 5: Confirm your name and contact details and enter an Explanation of Use, then select Confirm Request. Step 6: Your booking has been requested and you’ll receive an automated email to your university email address. However, **your booking will not have been confirmed until you’ve received a confirmation email**, which will arrive after we’ve processed your request. You can review the status of your bookings or cancel your requests by logging back in to https://mspluswrb.cf.ac.uk/libraries/ and selecting My requests. Please also refer to our study room code of conduct.